Two of Canada’s largest pension funds are raising their stakes in the U.S. office-building market in a bet on a strong recovery of the world’s largest economy. 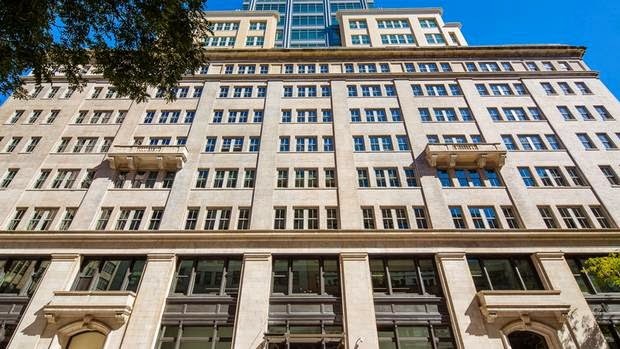 Ivanhoé Cambridge, the real estate arm of the Caisse de dépôt et placement du Québec, is boosting its presence in high-end U.S. office properties with the $150-million (U.S.) acquisition of a 49-per-cent stake in a midtown Manhattan property, in partnership with Callahan Capital Properties. The deal is a joint venture with affiliates of Beacon Capital Partners. In a separate announcement Thursday, the Canada Pension Plan Investment Board (CPPIB) said it plans to invest $108-million to increase its stake in a Manhattan office property and signalled it is looking for more U.S. office real estate in key markets. Ivanhoé Cambridge’s investment is in 330 Hudson, a 467,000-square-foot, 16-storey Class A building in the Hudson Square section of Midtown South. CPPIB said it is increasing its stake in One Park Avenue to 45 per cent through a joint venture with Vornado Realty Trust. CPPIB previously held an indirect interest of about 11 per cent through its investment in the Vornado Capital Partners Parallel LP fund. The property is valued at $560-million, including the assumption of $250-million of debt, CPPIB said in a statement. The Caisse, CPPIB and other Canadian pension funds are “betting on the U.S. recovery. They think employment gains are going to continue,” said independent pension fund analyst Leo Kolivakis. “It’s fine to bet on the U.S. recovery but it can falter. There is still a lot of uncertainty in the global economy,” said Mr. Kolivakis, who writes the Pension Pulse blog. Also last year, the Caisse placed $360-million in a twin office building complex in Chicago. “We are delighted with the addition of 330 Hudson to the Ivanhoé Cambridge/Callahan portfolio as it exemplifies our strategy to build a high-quality office platform concentrated in top markets around the world,” said Tim Callahan, chief executive officer of Callahan Capital Properties. Ivanhoé Cambridge and Callahan have invested more than $2.1-billion in U.S. office platforms in five acquisitions. The Caisse’s real estate division has been bulking up on office buildings, shopping centres and residential units and moving out of hotels, which are viewed as riskier real estate. Last month, Quebec’s giant pension asset manager put up for sale two iconic hotels, Toronto’s Royal York and the Hotel Vancouver. CPPIB, which manages a fund pool of more than $219.1-billion (Canadian), said its U.S. office strategy is to acquire high-quality assets in major cities. “We look forward to further expanding our relationship with Vornado as we continue to build our office portfolio in the U.S.,” Peter Ballon, CPPIB head of real estate investments in the Americas, said in a statement. Bert Marotte contacted me last week for some "quick comments" on the Caisse and CPPIB buying U.S. office properties. I told him it's a good move given that employment gains should pick up pace over the next year and I prefer U.S. real estate over all other countries at this point of the global economic cycle. (Some real estate titans, like John Grayken, are betting big on European real estate, as well as that of Asia and the U.S.). It's important to understand that real estate is a long-term asset class and it moves in tandem with employment gains. Also, these large Canadian pension funds are buying class A U.S. office properties and selling riskier real estate investments to mitigate downside risk. As the article mentions, the Caisse is moving away from hotels because these are cyclical investments best left to other players, like Blackstone, which is close to an agreement to buy a group of select-service hotels from Clarion Partners LLC for about $800 million. Blackstone is making a killing off their hotel investments and this too suggests they are also betting on a strong U.S. recovery. But despite being dubbed the best asset class, real estate has plenty of risks. First, it's an illiquid asset class, so in a downturn, you're stuck holding it as the values decrease. And even class A office properties can get hit hard if things really get bad. Of course, pension funds have a long-term investment horizon and can ride out these cyclical storms, but if we enter a protracted debt-deflation spiral, real estate will get clobbered. Second, like all other private market investments, the prices of real estate investments are being bid up by global pension and sovereign wealth funds, sending cap rates to historic lows. This is why Leo de Bever, AIMCo's CEO, was recently quoted as saying "real estate keeps me up at night." Leo is more worried about how rising rates will impact AIMCo's real estate portfolio (for those of you investing in U.S. REITs, read this excellent Morningstar article on REITs for a rising rate environment). Third, even though I prefer U.S. commercial real estate to that of other countries, I am very concerned about the Euro deflation crisis spreading and also keenly aware that employment gains in the U.S. have been tepid following the 2008 financial crisis. Companies have been hoarding cash, buying back shares to boost CEO pay, but they haven't been hiring anywhere close to what they were hiring prior to the crisis and they're extremely careful with their real estate leases. Even as U.S. employment pushes past its pre-recession levels, employers are remaining frugal when it comes to office space. Employers have only reoccupied about 52% of the 142 million square feet that went vacant amid the economic downturn, with occupancy in the second quarter growing by 2.8 million square feet, according to numbers set for release Tuesday from real-estate-data firm Reis Inc. (REIS). The office vacancy rate remained unchanged in the second quarter at 16.8%, still near its post-recession peak of 17.6% in 2010 and well above the 12.5% rate in 2007. Meanwhile, rents sought by landlords have grown 7.2% since 2010 and 0.7% in the second quarter to an average annual rent of $29.49 a square foot, according to the Reis report, which tracks 79 metropolitan areas. Rents typically rise with modest growth, even if vacancy is relatively high. There are several factors behind the sluggish performance. The office market tends to expand slowly in the years immediately following an economic downturn because companies remain skittish about costs. They often wait until their head count swells considerably before adding new space (click on image below). "There's a certain amount of underutilized space that needs to be taken up first," said Ryan Severino, an economist at Reis. But during this economic cycle, companies have been more reluctant than usual to expand, which many in the sector believe reflects a trend by companies to pack a greater number of employees into tighter spaces. This is partly a cost-savings measure but it is also a strategy some companies are using to encourage workers to collaborate. Seyfarth Shaw LLP, a Chicago-based law firm, announced in April it was moving to the Willis Tower, where it would occupy 195,000 square feet, from a nearby building where it occupies 300,000 feet, despite employing a steady number of lawyers. The firm plans to shrink workspaces, cut back space devoted to a law library, and, in a rarity for the legalprofession, it is considering taking some lawyers out of private offices and placing them in cubicles, particularly those who work part-time,said Peter Miller, a managing partner at Seyfarth. "We have an obligation to our clients to reduce our overhead and be more efficient," Mr. Miller said, adding it will save "multiple millions per year." Making life harder for landlords is that an industry with substantial job growth—the technology sector—is known for having among the most densely-packed office space. Personal-finance website NerdWallet just signed a lease for 46,000 square feet in San Francisco's South of Market neighborhood. It expects to eventually fit a workforce of about 360 employees in the space. That is nearly twice the density of some banks, and not even the top executives will have private offices. "You want to be in a little bit more of a creative environment," said Chief Operating Officer Dan Yoo. "We'll be in bench seating with everyone else." Of course, unlike in much of the country, landlords in the area are doing just fine. The San Jose area—which includes Silicon Valley—and the San Francisco area led the nation in rent growth, with rents increasing 6.4% and 5.1%, respectively, over the past 12 months to an average of $26.66 and $37.84 a square foot, according to Reis. "We're going through almost four years of a solid run in San Francisco," said Victor Coleman, chief executive of Hudson Pacific Properties Inc. The landlord hosts companies including digital-payments firm Square Inc. and Uber Technologies Inc., which recently signed a large expansion. Most markets saw some rent growth over the past year, with only three—New Haven, Conn., Buffalo, N.Y., and Milwaukee—registering small declines. 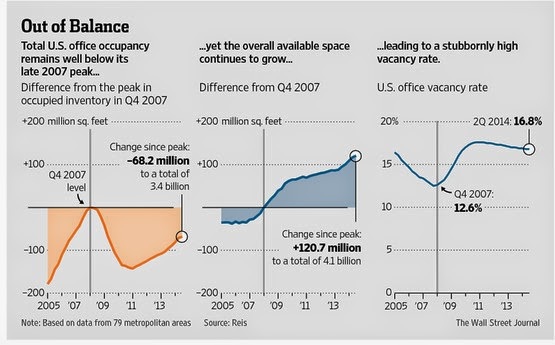 As you can read, the growth in office space is sluggish during this economic cycle for a lot of reasons. Companies are cutting overhead, not hiring like they used to, and packing employees into more densely packed offices to encourage more collaboration (might work for tech companies, not sure it works for law firms and other service industries where employees will want to kill each other working in open cubicles). And there are big regional differences in the United States. Silicon Valley is booming and will continue to boom, which is why the San Francisco area is leading the nation in rent growth. Latest Census Bureau statistics show that from 49th to 70th street between Park and 5th Avenues, a stretch of prime Manhattan real estate running from Midtown to the Upper East Side including a stretch overlooking Central Park, 30 per cent of properties were vacant for at least 10 months of the year. It shows you that even prime Manhattan real estate isn't booming like it once was. Below, Nicolas Retsinas, Harvard Business School, and CNBC's Diana Olick, discuss U.S. housing data and the strength of demand out there. This is a good discussion worth listening to. And even though I'm still short Canada, it is Canada Day, so take the time to listen to Chris Hadfield sing the Canadian national anthem (in both official languages) prior to a match between the Habs and Leafs (I love it! Doesn't he look a bit like HOOPP's CEO Jim Keohane? ).